I am not a “Trekkie.” Nor am I a “Trekker.” In fact, until recently I would have probably been considered in the Oort Cloud of Star Trek fandom. My experiences with Trek as a child were limited, as my family were very much more Star Wars kind of people and, honestly, what child wouldn’t take the explosions and lightsabers over debates and ethical quandaries. However, as I got older, I found myself drawn more to Star Trek, and found out that, even though we loved our Skywalkers and our Wookiees, there was a definite place in my family’s heart for Kirk and Spock. The release of the newest movie has rekindled my desire to explore this other titan of the Sci-fi universe, so I figured I’d begin as close to the beginning as I could without bankrupting myself on Original Series DVDs or trying to navigate the currently Herculean labor that is the CBS.com media player. So, I’ll begin at the best beginning afforded me, a VHS copy of the “Special Longer Version” of 1979’s Star Trek: the Motion Picture. 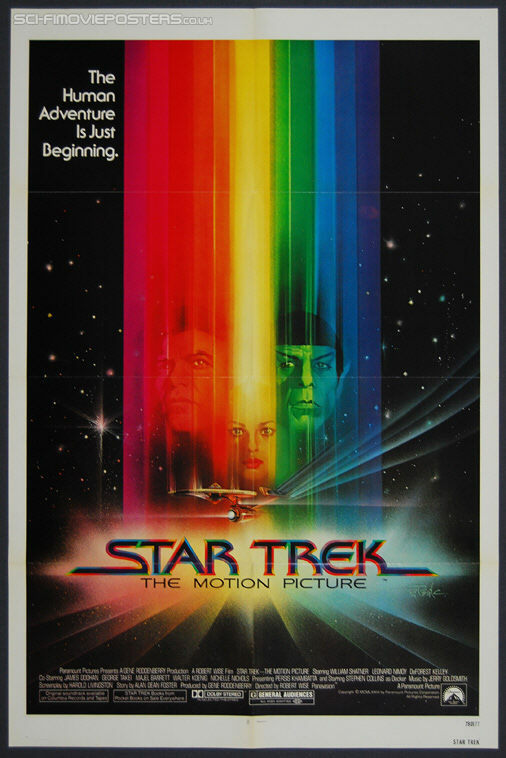 In 1978, plans were drawn up for a second series of the original Star Trek crew, which was to be entitled “Phase II.” When the plans for that fell through, Paramount Pictures looked to such box office bank as Star Wars, 2001: A Space Odyssey, and Close Encounters of the Third Kind, and decided that sci-fi had become quite profitable. As a result, the pilot episode of Phase II was restructured into a feature film, with an ambitious budget, a release date set in stone, and a director that seemed more at home on Broadway than on the Bridge. Still, the movie made money, and started a new movie franchise for the Trek faithful, and I would be absolutely remiss if I did not thank whoever I should who made that franchise possible. I remember renting The Motion Picture (or TMP, as we nerds call it) from the local library when I was around seven, an absolutely adoring it. I can only assume now that my youthful love of the film was due to the “It’s Captain Kirk! It’s Spock!” novelty that was afforded to a young geek like myself, as it had been a good twenty years before my birth that the show had even been on television. Still, I had fond memories of the gaily colored box, but as I popped it back into the VCR, I expected to have my childhood dreams dashed upon the rocks of elderly snark. You see, there is a sort of mantra that the Trek faithful love to chant: the evens are good, the odds are bad. This means that odd-numbered movies are usually of poorer quality than their even-numbered counterparts. Of most of the reviews and information I gathered (I went on a huge data-retrieval excursion before the latest movie came out) this seemed to be true, so I fully expected TMP to be not the colorful, recognizable geek-fest for a budding geek like I was in 1992, but rather a ho-hum slog like everyone else told me it would be. Imagine my surprise, then, when I find that I still love the movie just as much as I did when Clinton was first elected. I’ll start off with bad things: the uniforms are an absolute mess, and yes, the interior of the ship looks a bit sterile. Bones even comments that it looks like “a computer store,” which would make me wonder what he would think of the current, iPod-heavy Enterprise of 2009. Yes, some of the scenes drag (the wormhole in particular) and the characterization could have been stepped up, but for almost every one of these quibbles, I have an anti-quibble, and I refuse to end this line on a joke about Tribbles. The ship is sterile, yes, but it’s the future. Like I said, if people complained about the TMP Enterprise, what did they think of the “shiny white plastic with blue lights” look of the newest movie? If anything, that one looked even more sterile. Whilst some of the scenes do drag, I never felt like they were intolerable. I mean, this is space, and space is pretty darn big, so the big silent scenes really convey that message to me in the same way 2001 did. Sure, TMP may have ripped off 2001 quite a bit, but why not rip off from one of the best sci-fi movies ever made? As an added bonus for a new fan like myself, it was nice to get all those establishing shots of the ship and the interior, which leaves the remaining movies open to not bother with establishing shots and move onto deeper characterization. As for TMP’s characterization, it would no doubt seem flat if these characters were created for the movie, as Deckard and Ilia tend to be. However, the original crew are all people we, even the non fans, know, love, and imitate, so there doesn’t need to be too much given away. As a first movie, it does a perfect job of introducing everything and leaving plenty of character study to come in the later movie without having those pesky establishing shots to get in the way. You could say that my judgment is clouded because they did eventually make sequels, but honestly… did you really think they wouldn’t, even in 1979? As for the uniforms, I have no defense. They were atrocious. Now, let’s move onto the meat of the movie, and really the meat of any good Star Trek outing: the Science Fiction. You may recall that in my previous review, I outlined my ideas for what Science Fiction should be, and boy oh boy does TMP have it in spades. The film is steeped in sci-fi tones so strongly that you become surprised that this movie was made as it was. TMP was a perfect example of the market being there, so you could actually make a movie true to roots. The tone is slow-moving, deep-thinking, and pulse-pounding in the way that just makes you ache after a while, rather than jump out to shock you and fade away, and the final reveal is true science fiction glory the likes of which are almost impossible to see in today’s action-oriented explosion movies. The film is an absolute feast for the eyes, even by 1979 standards, and even though I’ve seen the new additions made in 2002 with CGI enhancements, I’m still in awe of the original. A common complaint is that it feels like an extra long episode of the television show…and for the life of me I still can’t understand why that is considered a complaint. In short, TMP was everything a Trek fan could have wanted to see on the screen, and it was a touching reunion and thought provoking journey that was well worth the wait. I will sneer in the face of convention and say this: I loved “The Motionless Picture” when I was seven, and I still love it at twenty-three. It shows what sci-fi is, what it should be, and that you don’t need a bunch of pointless action to tell a wonderful story. At its heart, any good Science Fiction story should work just as well even if it wasn’t in space, and TMP does just that, asking simple, yet simultaneously cavernous questions about humanity, purpose, and self, and does it all without one single shred of CGI (at least the version I saw). I will watch this movie again, if only to drink in the sheer, undiluted nature of Science Fiction…or at least the closest we will probably ever get again. As I said at the beginning of this review, I started life as a Star Wars kid (but not THE “Star Wars Kid,” thankfully) and I thank Star Wars for all its done…but as I make my way through the annals of Trek, I’m getting more and more tempted to turn my Special Edition DVD Trilogy Box set to face the wall.